Hello friends! 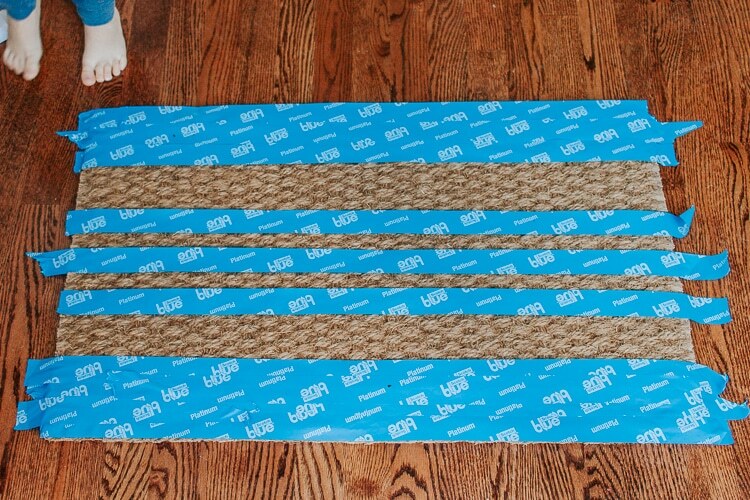 Today’s project is a super simple DIY doormat. You can customize this any way you want. I had my eye on a striped design and I’ll explain where I got the inspiration for it below. All you need is a plain cheap doormat, some spray paint and your creativity. (OK, you also need painter’s tape). 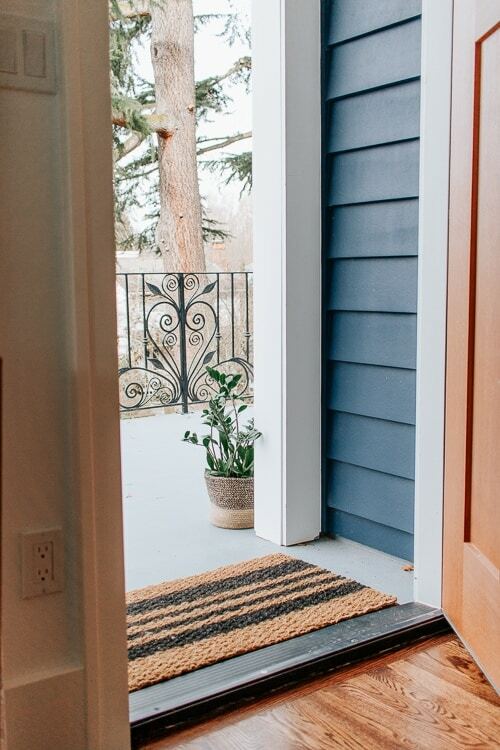 By the way, if you’re not really feeling the whole DIY doormat thing – then you can spend a bit more money and buy a nice one! 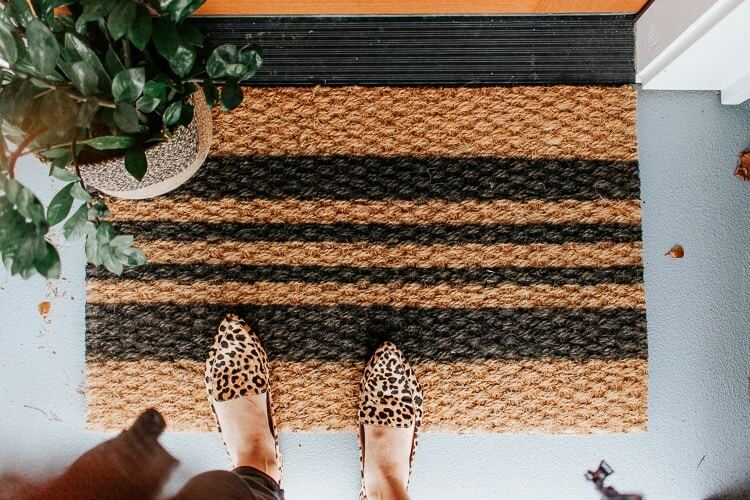 Check out this roundup of really cool doormats for Spring and Summer. 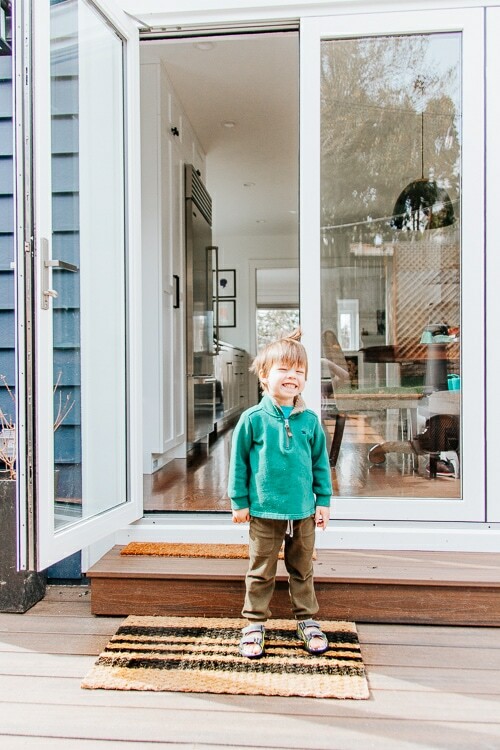 I used the IKEA Sindal doormat for this project. It’s a good size and it has a rubber backing so it stays in place pretty darn well. And for $7.99? I mean – (in your best Chandler Bing voice) -Can this get any more inexpensive? 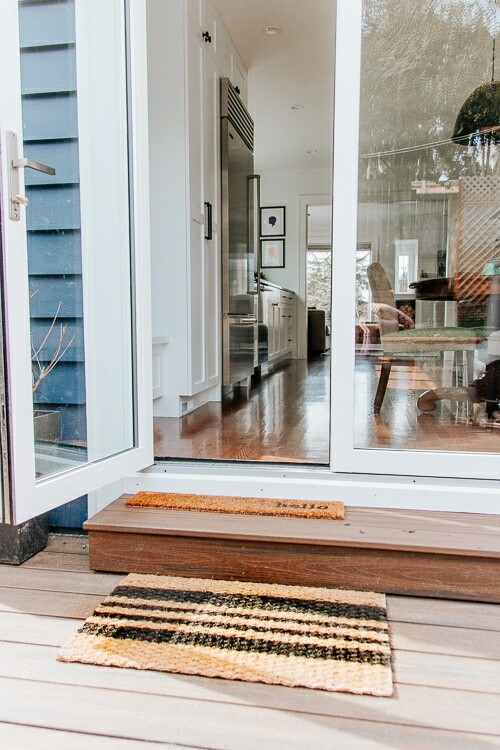 So read on to find out how I did a little IKEA hack on this DIY doormat. Want to know where this idea came from? 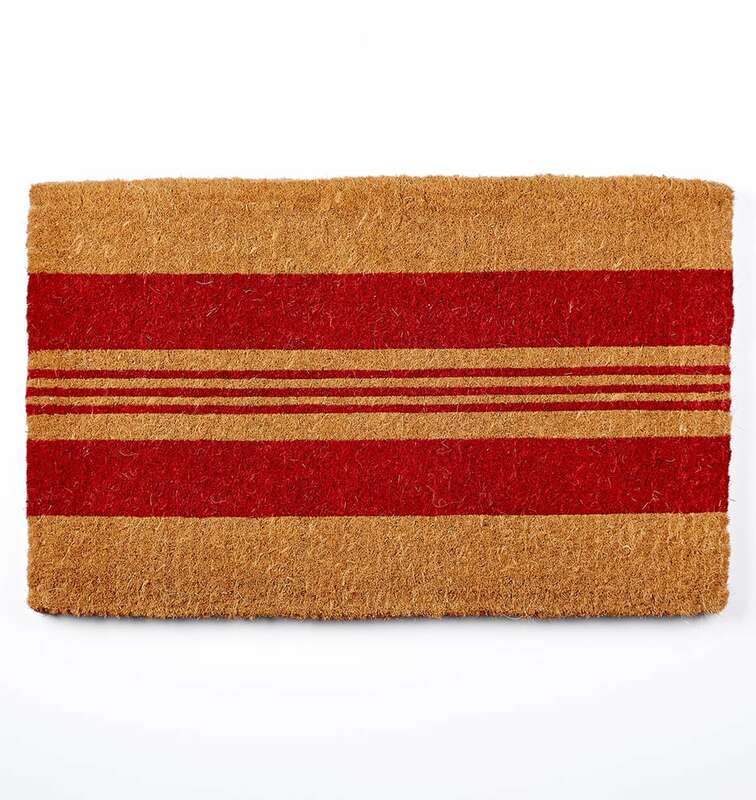 I was browsing home decor websites and came across this pretty striped doormat on Rejuvenation. Only it was $59! Our doormats tend to get pretty gross after a while and need to be replaced. I knew I didn’t want to spend that amount of money on something I would be replacing soon down the road. So I instantly got the idea to make my own version – but much much cheaper of course! 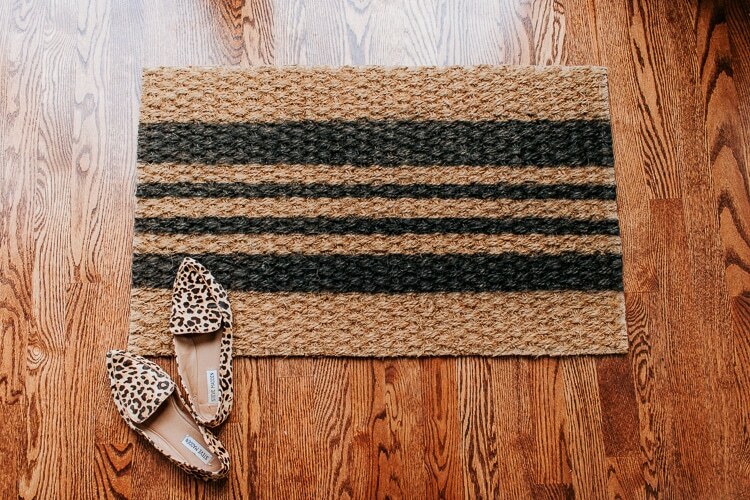 The first thing I did was look for plain doormats that were cheap (under $10!) And of course IKEA and Target were top of the list. Amazon has a bunch of doormats too, but they were over my price limit. 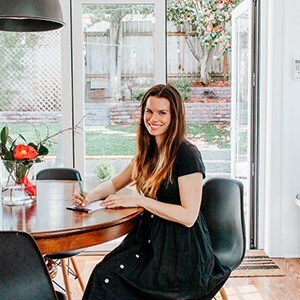 Rejuvenation doormat – source of inspiration! 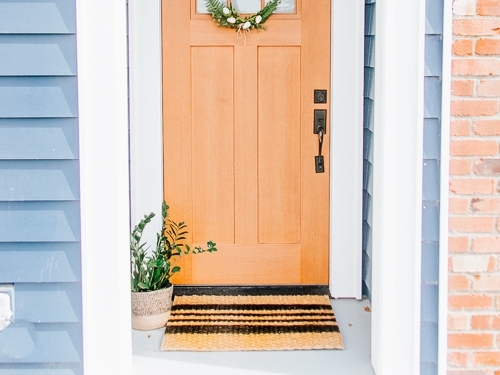 Start by taping your design on the doormat with painter’s tape. You may want to double up on your painter’s tape. Make sure the tape is really, really, ridiculously secure! You can even stomp on it to get it to stick better. Kids love this! If you want the same stripe design I did – look at the photos below and just follow my lead with the tape. Carefully spray paint the exposed areas of the doormat. 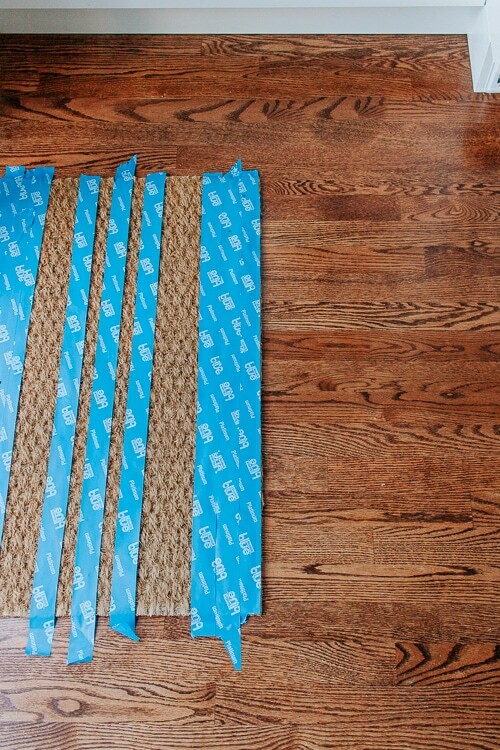 The rug will absorb some paint so you may have to do 2-3 coats to get it darker. I always spray paint outside with gloves on. 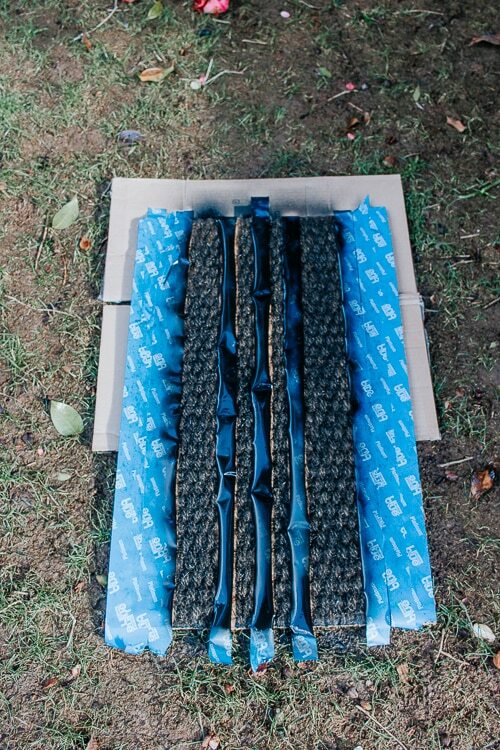 It’s best to do this project outdoors on a nice day. You may notice that you have a bit of run off from the spray paint on the covered areas. It wasn’t too noticeable on mine though so I’m ok with it. My little man makes a great doormat model! 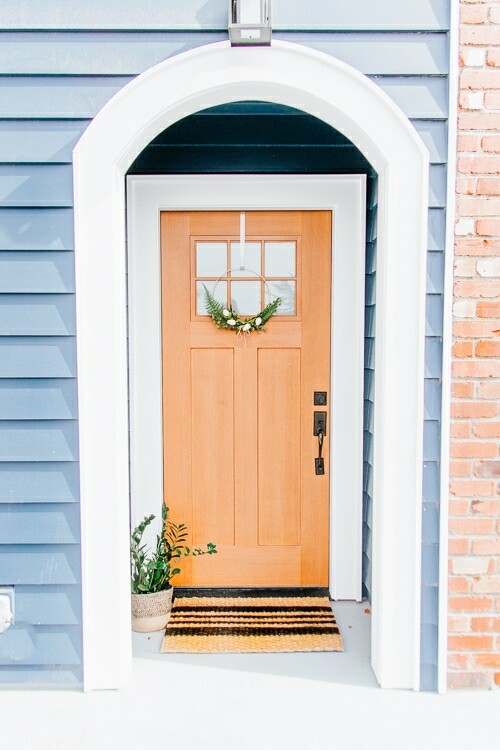 I hope this gives you some good inspiration for your front door and a good project for your weekend. This is super fun to create! It’s supposed to be sunny here in Seattle – can’t wait! How does the painted area do when wet or muddy feet scrape on it? Hi Joan! We have been using ours for a little while now and the paint still looks good! It may be ever so slightly faded but hard to tell. We wipe our feet on it as we come in the door. Fun project!